Do you have an interesting news article you would like to submit to AMT? AMT members can submit articles to AMT to be published on AMTonline. It's free and easy. You can post news about your staff, products, and other activities and insert images and logos with your text. Just click on the Submit Member News button to access the Member Content Submission form. Heterogeneous markets means multiple manufacturers, even more models, and diverse drive concepts. In addition, about three quarters of vehicles will continue to have traditional combustion engines. This puts production planners and automotive industry suppliers in a difficult situation: How do you manage this product diversity and increasing production volumes? For many years, EMAG has been providing answers to these questions with a broad range of production solutions for components used mainly in powertrain applications. Digitalization and e-mobility—just one of these megatrends would already be enough to unleash massive transformations in the manufacturing and machinery industries. But when both occur at the same time, what should change and how should businesses prepare? These questions will be the main focus of the 2019 EMAG Technology Forum to be held on May 15 and 16 in Salach, Germany. The event takes a comprehensive look into the future and at the same time provides very concrete answers to these questions and more. It will also be an opportunity to bring together both science and practice. Renowned experts will talk about “Tomorrow’s Mobility” and “Big Data” in the manufacturing process and EMAG experts will show new production solutions for e-mobility in a variety of sessions within the theme area. NEW hyperMILL® 2019.1 CAD/CAM SUITE OFFERS EXPANDED FINISHING CAPABILITIES, PROCESS OPTIMIZATIONS AND MORE. Top 7 Mistakes Manufactures Could Avoid When Choosing A Mist Collection Systems! There’s one basic rule of shop floor economics that everyone should know: if the machines aren’t making chips, the business is losing money. But the shape of those chips and their removal from the work area is every bit as important as producing them in the first place. For instance, the bird’s nest of long, stringy chips so common when machining aluminum, stainless steel, and superalloys is not only dangerous to the machine operator, but is a great way to break cutting tools and destroy workpieces when it inevitably becomes wedged in the wrong place at the wrong time. And few machining sounds are more cringe-worthy than the crunch…crunch…crunch of chips being recut, quite possibly signaling a chipped and soon-to-be-broken cutting tool. Is a 2-Axis CNC Lathe Enough? Whether they visited IMTS or not, anyone who turns parts for a living knows there’s an entire new breed of machine tool coming down the pipe, one that’s making shops everywhere take a hard look at their turning operations. They’re known as mill-turn lathes, and sometimes multitasking machines—whatever you call them, these ultra-complex, twin-spindle, dual-turret, automatic tool-changing, do-everything CNC lathes are surely the most-efficient way to produce a wide variety of complex machined parts. Due to increasing demand within the aerospace industry for more efficient ways to produce stronger, lighter parts, Beckwood will showcase hot forming, superplastic forming, and sheet hydroforming press capabilities at FABTECH 2018. Have a few dozen hydraulic manifolds to make? The KHV-400 allows you to machine the ports on each side using the horizontal spindle, and without relocating the part, machine the top face and intersecting holes with the vertical spindle. The same approach can be used on a variety of everyday workpieces, including mounting brackets, electronics enclosures, engine components, and more. The machine comes standard with 10,000-rpm cooled spindles, dual tool changers, loads of working space, and twice the productivity. 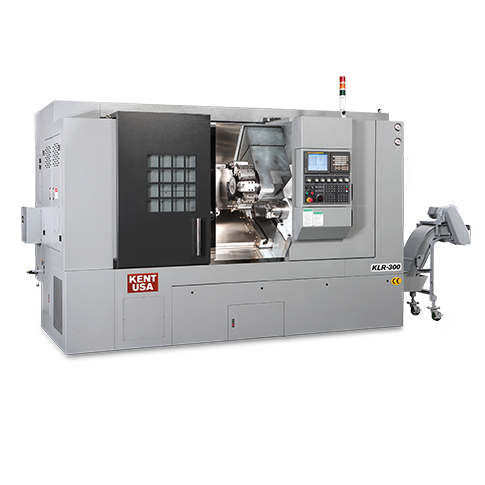 And if you’re wondering about programming what is essentially two machine tools in one, Kent Machine Tool has made switching between vertical and horizontal programming easy with an innovative merge function. Check it out—for many shops, the KHV-400 will settle the vertical vs. horizontal argument once and for all. Mistakes are less likely with a CNC. There’s no chance of cranking the handle one turn too far or forgetting to zero out the DRO after picking up an edge. There’s no need for a calculator or trigonometry tables when laying out a bolt hole pattern—just plug in a couple values and get drilling. That nerve-wracking pocket you worked on for two hours last week is child’s play on a CNC knee mill. Part quality’s better, tool life increases, and the pile of parts sitting on the bench at the end of each shift will be much higher when a knee mill has CNC capabilities. One look at the computer screen mounted to the side of the thing, though, and you might be tempted to avoid all that programming stuff and stick with your trusty DRO. But CNC knee mills are surprisingly easy to operate—the Acu-Rite MillPwr G2 control available on all Kent USA CNC knee mills, for example, is both user friendly and powerful, with simplified navigation screens, offline programming functions, Ethernet and USB ports, and a 3D-graphics display that will never leaving you guessing about a part feature. C & B Machinery Expands the Models and Features Available on Its Line of CBV Series Clamp Bore Grinders.